Ukraïnets’ na Zelenomu Klyni («Українець на Зеленому Клині»; The Ukrainian in the Far East). 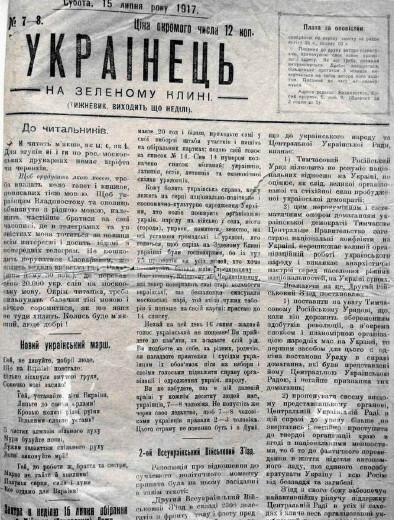 The first Ukrainian newspaper in the Far East, published weekly in Vladivostok from May 1917 to 1918. It had a great impact on the development of Ukrainian political activity and national consciousness in the Far East. The publisher and editor was Dmytro Borovyk. The paper published news and articles on political developments in the Far East, elsewhere in the former Russian Empire, and in Ukraine after the February Revolution of 1917. It printed the four universals of the Central Rada.